FairCoop is beginning to consolidate its new form of organization. Finally, thanks to the work of the last Summer Camps (in Décentrale, Mont Soleil, Switzerland, with the help of Synergiehub and SCI Schweiz), a new operating scheme has emerged, which we will detail in our next post. 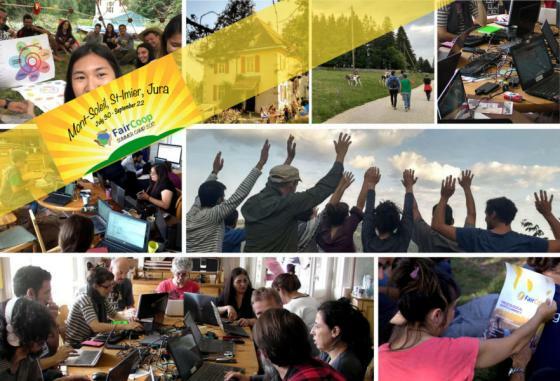 There, in Jura, we spent eight weeks of intense work in which we approached different aspects related to the FairCoop ecosystem. Two months of pleasant cohabitation and a continuous flow of ideas whose development we describe below. The first FairCoop camp introduced dozens of young people from all over the world (Ukraine, Mexico, Spain, Czech, Russia, Italy, Ethiopia) to the principles of permaculture, self-empowerment, synergy, solidarity, cooperatives, alternative economies in general, citizen journalism, democratic schools, etc… Working on building the dome, yurt, wood chopping, renovation of the veranda was an important part of learning how to self-organize and share the values of community life. At first, the camp was “chaotic”, according to the participants; later realizing that the “chaos” was part of the order they needed to establish with their hosts. Intensive work outside and inside the house, in the kitchen, promoting diversity and vegetarian food, weekend trips to lakes and mountain houses, and cities around Jura, was all part of the plan for them to learn and enjoy as much as they can during this process. Young people were surprised that everybody was equal, in the sense that there were no classic representative authorities like owners, leaders, teachers… They often didn’t understand everything that was part of the workshops and lectures, as a complex study of theory and praxis of subjects like permaculture, anarchy, cooperatives, blockchain and cryptocurrency economics, protesting at first that there was too much information. Participants were slowly introduced to communicating on Telegram, installing FairCoin wallets, buying some FairCoin, spending some in the Espace Noir bar in St. Immier, and learning a lot about how differences can be peacefully harmonized in a diverse group of people. It was interesting that one of the “conclusions” of the people participating in first of four summer camps dedicated to further development of FairCoop, was that they witnessed the movement needed to change the world away from its current capitalist system. During the 3rd week of August, a meeting of women took place to learn and reflect on this new technology. It was a great opportunity to meet, live together and learn both from Blockchain and the need to readjust everyone’s expectations when we want to move forward in a group towards a common goal. Women from diverse backgrounds, knowledge and expectations, embarked on the task of self-organizing both at the academic and logistical levels, with diverse results. The experience was certainly very enriching. In addition to the enormous and worrisome gender and class gap that this new technology is generating, we learned some of the enormous possibilities that will emerge in the immediate future from it. Complicated but exciting, we understood how the FairCoop ecosystem uses this technological opportunity to generate value and support the creation of a fairer world. We also set about creating a space for the study of crypto trading and its intricacies, in order to contribute from a female/feminist perspective. No less important was the realization that neglecting to care for each other and to consciously generate spaces for exchange and reflection – on what we want, and how we want to do things – leads us time after time to ways of doing that constrict us. A true reflection of what we have to do in our daily lives is needed, if we really want to organise from below and cooperatively – without anyone having to direct or supervise anyone else. Also if we want cooperative spaces really to be cooperative, so that in spite of the individualistic and hierarchical culture in which we have been raised, we are able to create spaces where we are all able to give the best of ourselves, and so take care of both people and the planet.